Having a go at Scrappin’ again! This time I have gone over the border and enjoyed another session with Fiona Paltridge. As soon as she said she was doing a grunge page I just couldn’t resist! I don’t know about you, but there is just something so relaxing and enjoyable about going to someone else’s workshop…you can just get messy and enjoy it! Anyway, here is what I made. I did take it home and add a little of something that I learnt from the Andy Skinner’s Book of Ruinations on-line class…and the whole page just ‘popped’ . This picture of me was taken when I was about 1 year old in my nana’s front garden. My nana had the best garden for kids to play in. It was so overgrown with lots of hiding places, things to explore and flowers to pick…and we picked heaps of them all the time. The Indigoblu butterflies on this page where sprayed with lots of different sprays out on Fiona’s front lawn…which turned blue after everyone had finished (so funny). PreviousI love Paris…even in the rain! this is absolutely fabuloous Dot . Love the colours and all that grunginess and texture . Your arrangement of all your lovely elements works a dream . Such a cute photo to showcase too . Oh my goodness Dot – this is amazing (or amazeballs as Fiona would say!). So glad you enjoyed the class. Love this page! You are a genius hunny bunny this is one amazing piece of artwork and thank you for a fantastic mornings crafting. This is absolutely stunning, Dot – the textures are incredible, and so brilliantly highlighted by the drybrushing. 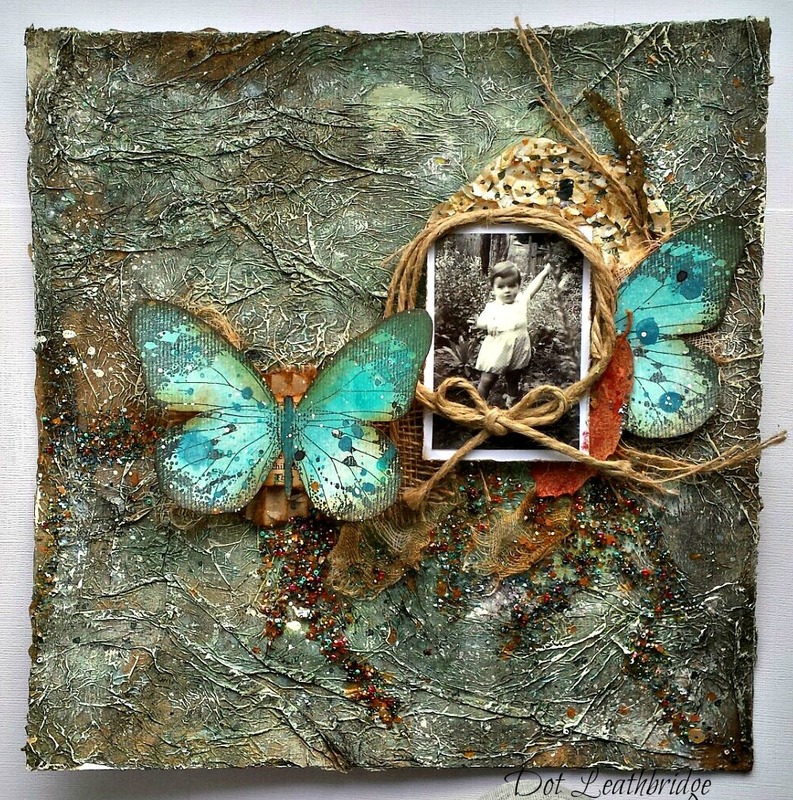 Fantastic glow to the butterflies, and I just love the twine framing of that adorable photo. Big WOW from me!